I want to welcome you all to another edition of Watch Out. This week I’m excited to bring you author Kelley Heckart. Welcome to Watch Out, Kelley, it is so great to have you here. Hi Savannah, thanks for having me as a guest on your blog. My current home is in Arizona with my husband and two dogs. Most of my time is spent daydreaming and writing stories with paranormal elements set in ancient and Dark Age time periods. My stories are influenced by Celtic, Greek and Norse myths. Can you tell us a little about your current publishing’s? I don’t think ebooks will make paperback books nonexistent, but I do think that ebooks will be popular because you can store a lot of books on a reader and take them anywhere. It’s nice to have both choices. I read ebooks and paperbacks. I am still stuck on paperback books, but I have an e-reader and I like that too. I also read ebooks on my laptop. I like having two choices for reading. I read in your bio that you had a passion for Celtic mythology. What draws you to that topic? I think what drew me to the ancient Celts is the mystery surrounding them and how they are linked to the otherworldly realm of the Fae. I spent many years reading different books on the myths before I even began to understand it all. If you could be a mythological creature who would you want to be? I think I would like to be a shapeshifter because I would love to be able to shift into a bird and experience flying, or into a wolf and experience running through the forest and being able to run fast and leap over fallen trees. Some of my favorite Celtic myths are of the Irish Fianna (supernatural warriors), the Tuatha de Danaan (Irish faeries described by Y.B. Yeats as ‘tall and noble and able to change their shape at will’) and the story of the ill-fated Deirdre. It’s hard to believe now, but I used to be pretty wild. Once upon a time I used to play bass guitar in an all female hard rock band with influences like Iron Maiden, Black Sabbath, Queensryche and Van Halen. I love the creative part of writing, coming up with the ideas and creating the characters. I don’t like editing my own work, but I enjoy editing for other writers. Weird, huh? I am on the seventh book of Jack Whyte’s Camulod Chronicles. I love how well researched this series is and his historically accurate take on the King Arthur legend. While I write paranormal/fantasy historicals, I love to read straight historicals and add historical accuracy to my stories. I think what sets my stories apart from other romance writers is that my romances are unusual and don’t follow the normal romance formula. I haven’t started writing my new book yet. I’m still in the research stage, but I could come up with a first line or two. She tried to scream, but a large hand clamped against her mouth, silencing her. A hard male body pressed into her back. His well-muscled arms embraced her, sending a thrilling tremor down her spine. He smelled of woodlands mixed with the clean scent of soap. The feel of his body and his clean smell took her by surprise, paralyzing her. Terror finally gripped her, sending her heart galloping, and the instinct to struggle out of his arms kicked in. She thrashed against him. She nodded and relaxed, sensing he told the truth for why would he lie? Runa never thought this would be how she would meet her betrothed. Best advice you ever got with regards to writing? I learned this tip on how to find sentences that are too telling—search for was and were and try to rewrite these sentences with stronger verbs. What do you like to do in your spare time when you’re not working on a new book? It seems like I am always working on a book, blogging or editing, but I do try to take breaks. My favorite day here at the house is Sunday because it’s movie day and a way for me to spend time with my husband. He’s pretty good about watching chick flicks and the fantasy stuff I like, but recently I accidentally picked The Lightning Thief and then the following week, Clash of the Titans on Netflix. He complained that they were the same movie, which was sort of true, and now I am banned from picking any movies with Greek gods for a while. LOL. Prince of Persia will have to wait a bit. I hate writing the synopsis because most publishers want it to be short and it’s hard to write a short synopsis for an 80,000 plus word manuscript. What advice would you give to new writers out there? My advice to new writers is to learn the craft of writing and to write from the heart. And most important of all is to write, write and write. 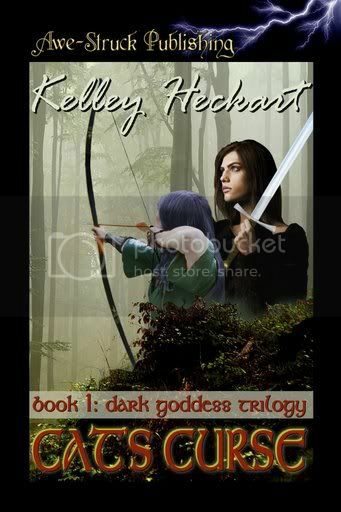 I have a website at http://www.kelleyheckart.com with information on my books, buy links, excerpts and information on some of the subjects I write about—a couple of pages on the ancient Celts, the Picts, the Tuatha de Danaan, a list of faeries and info on pre-Hellenic goddesses. Readers can even request a free chapter from any of my available books. Supernatural warriors and shapeshifters sound good to me. It was fun meeting you and learning more about your books, Kelley. I went to Kelley’s website and her book covers are really cool. It was fun being able to learn about here. Opps! I meant to say, It was fun being able to learn about HER here. Fingers flying over the keyboard-LOL! Thanks for taking the time to read about my books and comment. Thanks again to Savannah for having me as a guest.